I don’t even know where to begin. Yes I do. I was nervous about this match. So nervous I didn’t even sleep last night. It was important to win. We could win. But we would need the right lineup. When that came out, I knew we were down 1 count. And I knew injuries were going to hurt us bad in this one. There were some key players who could have really taken this one to the Napoli defense. Down 2 counts, and it wasn’t even 6 am here. But never in my wildest dreams did I think the match would turn out like this. Not just a /FACEPALM, but /DOUBLE FACEPALM. "I need to play against Udinese! We have too many injuries!" There were seven yellows in the match. Napoli got threeof them, one to Cavani in the 60th, another to De Sanctis in the 63rd for “telling” to the Assistant Ref, and the 3rd to Paolo Cannavaro, no explanations needed, he likes his cards. Van Bommel earned his early on, in the 13th minute to be exact. Which means that he will be suspended against Udinese. (mini facepalm here.) In the 39th, Seedorf earned one for a boot to the head of Gargano. Had Gargano been standing upright when that happened, Seedorf could have been sent off. Emanuelson earned one in the 75th, and Mexes rounded out our yellow card collection on the day with one in the 78th. And now for /FACEPALM #1. Ibra’s red card. The ref had called a foul against Napoli, but things got a little heated, and the big guy reached around Nocerino and gave Aronica a little face slap. 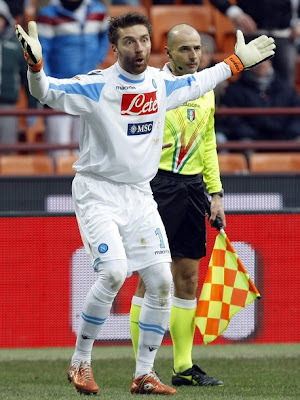 Which is why De Sanctis went to tell the teacher er… AR, who apparently just happened to miss Aronica’s retaliatory slap of Nocerino’s face. Rizzoli: What’s up? I whistled for the foul. It should be an free kick for Milan. 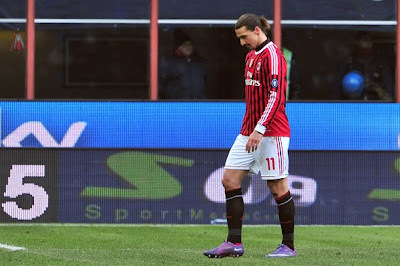 AR: But that mean big bully Ibrahimovic slapped that little defender Aronica, I saw it! Rizzoli: You’re sure about that? Rizzoli: Well, this changes everything. 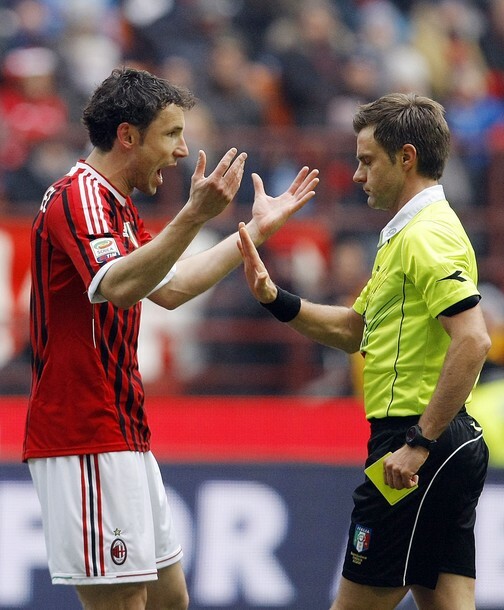 If I give Ibrahimovic a red card, there’s no way they’ll suspend me like they did Rocchi. Thanks! AR: Remember me in your match report! Rizzoli: Oh, I will. When the FIGC reviews this and hands the big guy a big ban, your name will be in the report quite favorably. I would have given him the yellow just for that face. Okay, I actually have a lot of respect for Rizzoli, he’s a good ref, but it’s just weird that this happened to us 2 matches in a row. And damn you, Ibra! Everyone’s going on and on about your February no-scoring curse, and here I’m thinking you’re going to prove them wrong, and we start it off like this. I’m shaking my head at you. I know you must be tired and frustrated, and Allegri promised you more rest this year. But I will lay into him a little bit later. So Ibra will miss Udinese, probably Cesena, and possibly the league match with Juventus. He will be available to face Juve in the Coppa match on Wednesday, and of course the Champions League match against Arsenal at the San Siro. Here’s hoping he makes those matches count for us. And even though we know we can play without him, our injury woes leave us so short-handed already, it’s hard to see a player out unnecessarily. This pic explains a lot. He's simply out of his mind. FACEPALM #2 This one is actually worth a hundred million facepalms, I think. 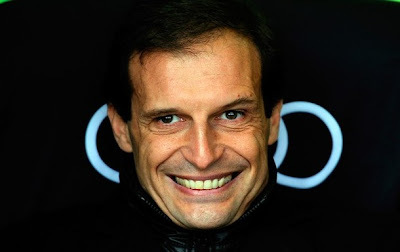 I love Allegri, I respect him a lot, but my singular biggest complaint about him is how constipated he gets about subbing. And this match was his worst ever. I have NEVER seen a coach with subs available NOT sub immediately when someone was sent off. Okay, I probably have, but he was already overdue to sub someone, and still he waited. Ibra was sent off in the 64th, and he waited until the 76th to sub. And then he brought on Ambrosini for Seedorf at that point, a sub he should have made at halftime or shortly thereafter. But once Ibra was sent off, we were down to only Robinho up front, who is definitely stronger at creating plays than scoring, at least of late. And honestly, he wasn’t doing either until right before the 86th, when he was finally subbed off for Maxi Lopez. Yes, that’s right, Maxi, who in all of 12 minutes or whatever that he has played for Milan has only shown why he was benched often at Catania. 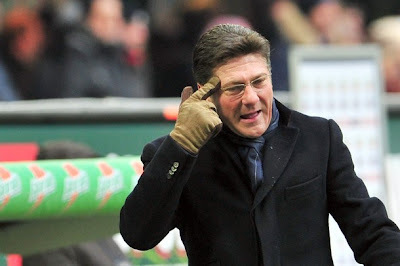 Yes, Mazzarri, we know that Allegri's substitutions are like shooting ourselves in the head. De Sanctis and Aronica just having a friendly chat, Southern style. Okay, I know this is a very long rant, and I’m usually so positive and all of that other stuff. But I woke up at 6 am today to watch us throw away a perfect opportunity - Juve drew, Udinese and Inter lost, if we had won, we would have gained back what we lost at Lazio. At least we didn’t technically lose any ground, but we have to remember that Juve have that game in hand. My biggest frustration is that Ibra’s sending off and even more so Allegri’s lineup and substitutions are what cost us this opportunity. An opportunity that seems ridiculous to have wasted. Hopefully everyone will regroup and Allegri will come out of his little timeout chair and make better choices midweek against Juve. And hopefully Ibra, who has for the second year running given himself the rest he needed the hard way, will clear his head and give us that big Swedish 110% on Wednesday in the Coppa. And now I am going to try to get some sleep. Hopefully, I won’t have recurring nightmares of this /DOUBLE FACEPALM.